Accra, Ghana Bath, UK Boston, USA Cape Town, South Africa Sao Paulo, Brazil Sydney, Australia - and no doubt many more. Last year I was in Bangalore, India, for the same weekend where the Indian Vegan Society organised the India & SE Asia Veg Congress (all vegan as always these days of course). The photo below is some of the great music at that event. WVD was on the Monday and we had a trip to a vegan organic farm near the city with more traditional Indian music and dancing. This year Hazel and I headed for a slightly less exotic but equally impressive venue, the West Midlands Vegan Festival in Wolverhampton, about an hour from home, where I was giving a talk on the history of veganism. We arrived at 11.00am, just as the doors were about to open – and found the extraordinary sight of a huge number of people queuing all along the street, to get into a vegan event. It would have been hard to imagine that ten years ago. As I was due to speak at 12 noon we jumped the queue and went in to meet lots of old friends who were at their stalls waiting for the crowds. And it did get very crowded – the photo below is just one end of the main hall, and *before* most people came in. By 1.00pm it was getting difficult to move around. By 4.00pm over 1,500 people had gone through the doors, and more were still coming in, quite amazing in a town that few people outside the UK will have heard of, and many in the UK only know because of the football team. We met friends from Manchester, London and Leicester, and there were many more that had made long treks to be there. The Vegan Society (below left) and the Vegetarian Society (right) were both getting plenty of interest on their stalls. It was great to be at a vegan event where all vegetarians were equally welcome, without the sort of hostility we’ve sadly seen in some places. We’re all on the same path. A couple more of the stalls below – the guy in bear suit must have been getting rather hot as it got ever more crowded . . . and a colourful food stall seen from above. As well as the main trade hall and eating area, there was a big café/bar with music, comedy, poetry and more going on. Plus upstairs and downstairs were cookery demos and three lecture/workshop rooms. I spent an hour giving my talk on vegan history in one of these rooms. Considering all rival attractions I was pleased with the attendance, and they seemed to find it interesting. I was also very grateful to the Vegan Society, Amanda in particular, for letting me use their projector and setting it up for me. If anyone wants a brief summary of the talk see: www.vegsource.com/john-davis/veganism-from-1806.html - at the end of that is a link to a much more detailed collection of articles. Meanwhile, I’m off to China on Sunday, my second visit there (and no, IVU is not paying for this either), this time to the city of Hangzhou. 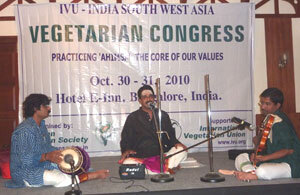 I’ve been given the honour of co-chairing the first session of the first ever veg congress in that remarkable country. More about that next week.